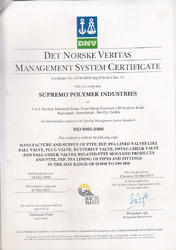 Established in the year 1997, we, Supremo Polymer Industries, are an ISO 9001:2008 certified manufacturer and supplier of a broad array of Industrial Valves and Fittings. Under this range, we offer clients Ball Valves, Plug Valves and Butterfly Valves. Manufactured using best quality raw materials, these products are known for their dimensional accuracy, fine finishing and durability. We offer these valves and fittings in various dimensions and other specifications, to suit the exact requirements of clients. To perform all the business activities in a streamlined manner, we have appointed highly experienced and knowledgeable professionals who are equipped with vast specialized knowledge of this domain. Apart from this, we have developed a contemporary infrastructure that is equipped with advanced technology based machinery and multiple amenities that enable the smooth functioning of the organization. Focused on achieving our organizational goals in a timely manner, we take several measures to be able to function with utmost efficiency. Our offerings are designed with utmost precision using only high-grade materials and sophisticated technology. We subject our products to several quality checks based on a myriad of parameters before making them available to the customers. With our commitment to fulfill our customers’ requirements, we design our products in several specifications as per the stated requirements of our patrons. As a result of our dedication, we have established a vast vendor base that is inclusive of Biotech Limited, Kiri Dyes and Chemicals and Orient Paper Mills. We have gained immense insight and as a result, established a commendable reputation for ourselves under the adroit leadership of Mr. Kirti Patel and Mr. Amit Patel. Our mentors have led us on the path to success and have enabled us to look forward. Manufacturing and Trading of Industrial Valves and Fittings.